The Anonymous activists behind "OpKKK" -- which infiltrated and unmasked Klan members, including many in US military and police departments -- began by creating thin-but-plausible fake identities on Facebook that signalled support for "Blue Lives Matter." By friending other accounts that indicated support for Blue Lives Matter, they found themselves being auto-suggested friendships with KKK members. The more Klan accounts they friended, the more the Facebook algorithm located new ones for them to solicit for mutual friending, and the more plausible they seemed to anyone contemplating friending them. They were greatly aided by the Klan's primitive recognition loop: a Klansman asks "AYAK" ("Are you a Klansman") and listens for the response "AKIA" (A Klansman I am) -- the KKK has a long history of dopey, D&D-inflected wordplay. As the Grugq points out, closeted gay people had better tradecraft than this with the whole, "friend of Dorothy" thing. The KKK, by contrast "aren’t really good at handling insider threats or figuring out how to keep threats outside." That means "When you want to punch a Nazi in the face, they’ll be easier to find and hunt down." “Most of them were poor,” OpKKK told me. In one instance, Thomas Moore complained that he was broke and couldn’t pay his electricity bill. He needed $230. What’s particularly funny about this is that Moore wrote, “They’ll never get me!” then gave the Anon information after he offered to help with his bill. He even included the last digits of this social security number. The bill was never paid by OpKKK. Someone else helped the Little Feller out. 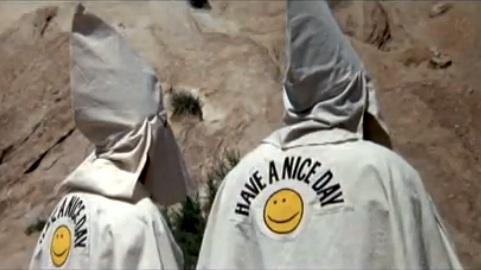 OpKKK observed some usual conversations in the groups. In one, group members discussed a man named Jimi Miller who was late to the last Klan rally. One member asks if he’s “friends with the sheriff who wanted to join in.” Another says he’s the guy who “killed Jesse” Another member said, “yup.” So they just admitted to murder.